Another month another beauty box, this time in the form of Cohorted Beauty Boxes. I'm so over the moon with this months picks, and I've actually got my fair amount of use out of pretty much every product which is a rarity for me, usually these things tend to get neglected, sadly. So let's get into the box, shall we? This month's box adds up to £93 so you really do get your money's worth; it also has five beauty bits and a chanel code for money off yo' lippies - super! 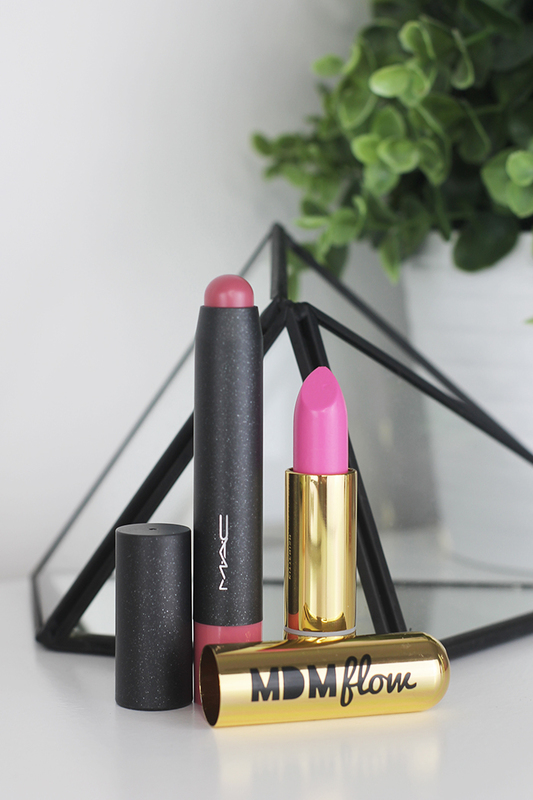 The first product that immediately caught my eye was the MAC Patent Polish Lip Pencil in the shade Spontaneous; the perfect dusty tea rose shade which would work a treat this coming summer. I was also pretty chuffed to have received The Body Shop White Musk Libertine Eau De Toilette/Perfume. White Musk was one of my favourite scents during high school so this was definitely a blast from the past, I love the sweetness of this particular scent, it's so fruity and feminine - and it's cruelty free! Cohorted also included another lipstick, this time from MDM Flow in the shade Panther. This isn't a shade I would usually gravitate to as I really don't suit pinks which is such a shame as the formula is so beautiful. It packs a punch colour wise, and certainly still feels moisturising and looks semi-matte on the lips; I'll probably gift this to one of my friends so it gets the use it deserves. As well as makeup products, Cohorted also threw in a bath time luxury in the form of the Miss Patisserie Bath Melt. I was so excited when I saw this little guy hiding in the box, I love a good bath and I love post bath melt skin even more. I'll be popping this in my bath at the end of the week when I can finally wind down. This smells amazing and not to mention the fact it looks like a (very realistic, can I eat it? Probably not..) cupcake is just so cute. And last but not least by any means is the Gold Elements Nail Care Kit. I actually am really truly impressed by this, I'm one of those that definitely doesn't take enough care of myself when it comes to hands and nails generally, so to be able to have an all in one kit is amazing. The hand cream works incredibly well and keeps my hands moisturised for a good few hours, and the same goes for the cuticle oil. I can't wait to put this to better use and finally have nice hands and nails again - it's been far too long. And that's it ladies and gents! I love the diversity of products that you get in beauty boxes like these, and they're a great way to discover newer indie brands. You never know, you might find your new staple product in here! Have you tried a beauty box before? What're your opinions?